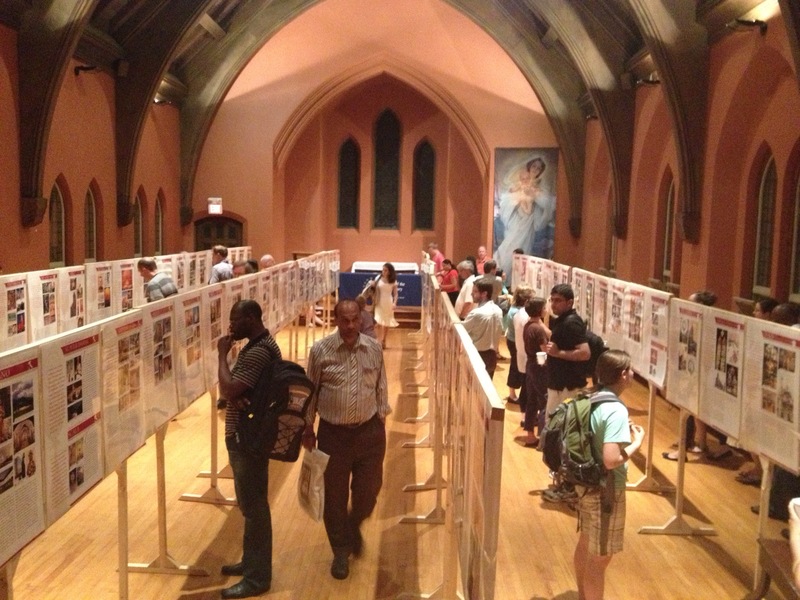 The Real Presence Eucharistic Adoration Association has put together a photographic exhibition of Church-approved Eucharistic miracles from around the world. 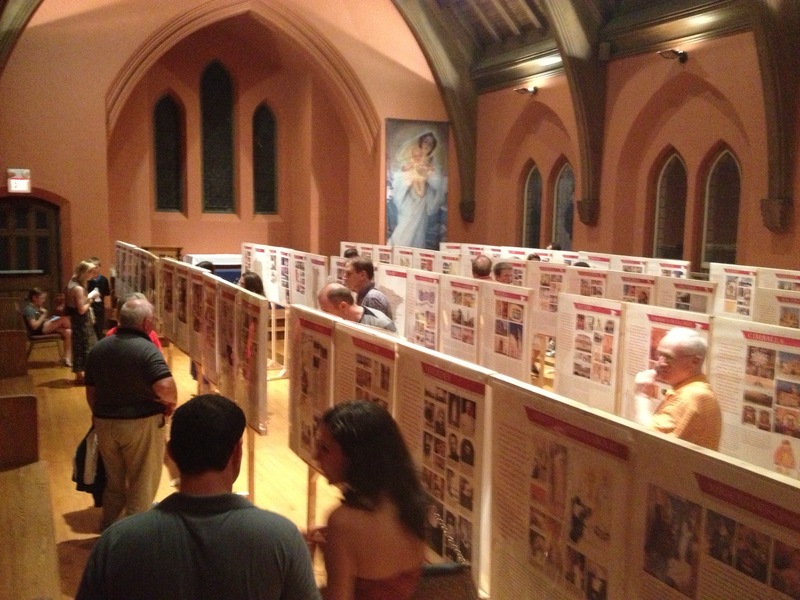 We have this exhibit and are happy to lend it to any chapel or parish in New England that is interested in having it. What is included in the exhibit? Books for purchase, which include all of the miracles featured in the exhibit, so that people can continue learning at home or share this information with others. What is required of the host parish? The pastor or head of the chapel needs to invite us to bring the exhibition. You will also need to notify Carol J. Seydel at Real Presence Eucharistic Education and Adoration Association at 815-254-4420 of your intention to host the exhibit. This is the organization which created the content of the exhibit and holds the copyright. They gave us the information and we printed and laminated the physical posters and made the stands. The minimum space necessary to hold the full exhibit is ~ 1300 square feet. However, you can also display just a portion of the exhibit if space is limited. (See the photographs of a sample exhibition.) For example, a host parish with a specific ethnic identity may wish to feature the posters for their country of origin. We will transport the exhibit to and from the parish, but it is helpful to have 2-3 responsible adults to help us set up and take down the posters and stands. This takes approximately 2 hours for the full display. One or two responsible adults to be available to sell books and answer questions during the time when there are a large number of visitors to the exhibit, such as immediately after weekend Mass. Book sales are optional, but strongly encouraged. Please have appropriate supervision during the time the exhibit it open, so that none of the posters or stands are damaged or stolen. There is no standard fee to host the exhibit. However, we ask that a free-will collection basket be made available to help defray the cost of printing and laminating the posters, building the stands, and transporting the exhibit. When should we host an exhibit of Eucharistic Miracles? Basically, anytime is a great time because there is still so much confusion and misunderstanding about the Eucharist, especially the Real Presence! If you have an adoration chapel, why not consider hosting it as part of an anniversary celebration? It could also be a great way to attract new adorers. You could tie it into some Feast Day in the Church calendar, such as the Feast of Corpus Christi, Christ the King, Easter, or Pentecost when many parishes host Ministry Fairs. You can keep the exhibit for as long as you like, within reason. However, we suggest that you have it on display for no more than two weekends in a row. Shorter, limited engagement events usually generate more excitement than long-term or permanent displays. How do we go about setting up an exhibition? Send an e-mail to Eileen and Diane at adoration247@gmail.com and let us know the dates you are thinking of hosting this event.